Be a part of one of the biggest dedicated consumer shows in East Anglia! Over three extraordinary days, a staggering 33,000 dedicated gardening enthusiasts were welcomed through the gates of the fourth National Flower Show in 2018, confirming it as arguably the biggest consumer show in Essex. The hotly anticipated show cemented The National Flower Show reputation as one of the leading horticultural events in the South East. Following the success of 2018 many stands are already allocated so we would urge you to sign up below and ensure your application is in early. The confirmed dates for our next show are 17th, 18th and 19th May 2019. The show is held in the spectacular grounds of Hylands House with a Grand Floral Pavilion, 3 Country Craft pavilions, Huge Food Pavilion and an upmarket Home & Interiors Pavilion. There is also outside space available on beautiful level grass. To apply for a trade stand call Daphne on 01702 549623, email daphne@aztecevents.co.uk or fill in the exhibitor application form. The National Flower Show is one of the most vibrant, exciting flower shows in the UK. 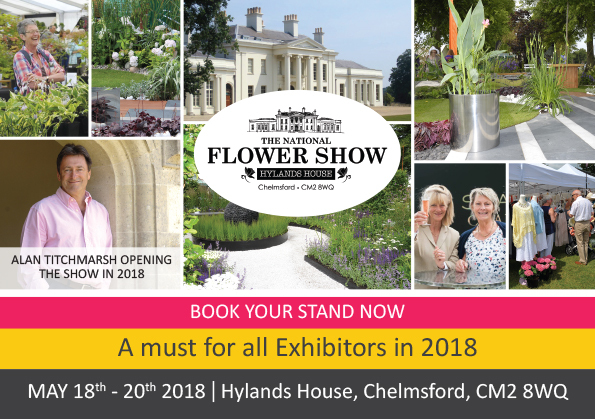 Now in it’s fifth year the show has established itself as a definite diary date on the national show calendar with exhibitors travelling across the UK to sell their products. The show offers an exciting opportunity to put your company in front of an affluent and passionate audience of hands-on gardeners. Whether you are looking to launch a new product or increase brand awareness, The National Flower Show could help you achieve all your marketing needs.